I don’t quite believe in horoscopes but I have got to admit that as a Leo, I fit the said personality to a T. Especially my passionate nature. It’s true, I have various passions, all of which I pursue with great zeal and the most obvious one is self-explanatory – which explains the existence of this humble food blog. Seriously, FOOD is like my second name. That’s what most of my friends know me for, my great passion for food – both producing, appreciating and consuming it. I am not really sure how to properly explain it, but let’s just say that I take immense joy in using my humble talent to make others happy. I enjoy it when I see others enjoying their food, especially if made by me and I just gotta say – food goes beyond feeding one’s hunger. Some of you might have noticed the various occasions when I post about me baking or cooking for an event of some sort at Amplify (the youth ministry I’m in) and well, this post itself has alot to do with that. You see, I’ve decided to take my passion for baking and cooking to a higher level. I recently assumed the role of Food & Beverage head at Amplify. I won’t deny that it’s going to be loads of hard work, but really, I’ve been thinking about it and I think God couldn’t have made it clearer. I want to use my skills for the benefit of others and to spread His love at the same time. It’s a belief of mine that one can actually taste food and notice the difference – whether it’s cooked with love, or not. Sounds utterly cheesy, but seriously, it’s usually rather intangible but that’s just one way I see food. 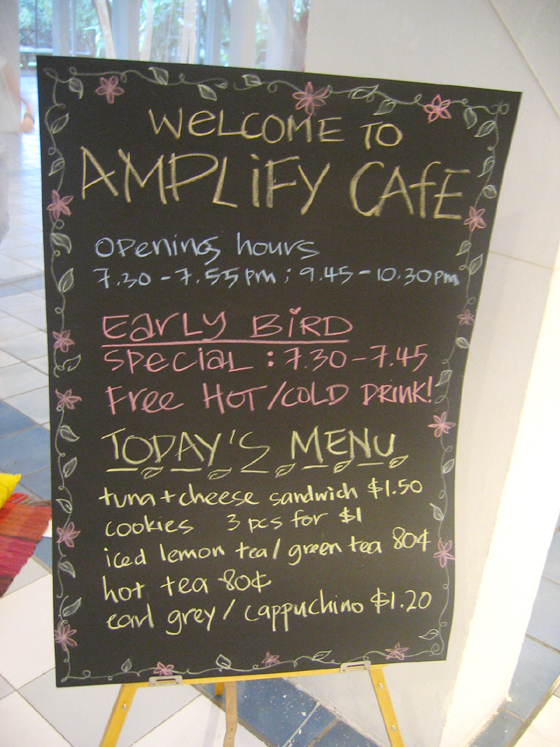 At Amplify, the hospitality team (of which the F&B dept. 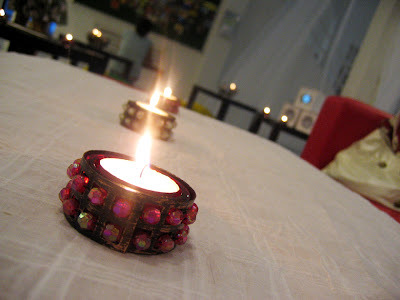 works very closely with) has recently launched Eden, a lounge area at the foyer where we reside. So before session starts, this area will be a place of fellowship where youths will gather and enjoy good food, music, and company. Doesn’t it all sound uber exciting? Well I think it is. I seriously can’t think of a better way to utilize the space and turn it into a haven. Though the lounge isn’t a permanent fixture, I think it’s a great start – to have it every Friday before session! Amplify holds what we call Amplify Fridays (it usually consists of lively praise & worship – the band rocks! + inspiring teaching, etc) every weeknight at CSC (Catholic Spirituality Centre) and we just had our first Friday of the year this week! It also marks the opening of the lounge area. I’ve got to take my hats off to Lydia (head of the hospitality team), Flo, and Winston for coming down super early to set up the place. Also, to the rest of the hospi team: Larris, Nat, Vivian, Rebecca, Lynette, Thelma etc… Thank you! 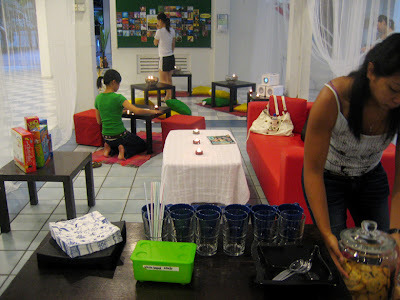 It is not easy to set up and then clear up the place all in one day. It couldn’t have been done without each and every committed person in Amplify. Now, I’ve said so much, now let’s see what’s all this hoop-la about! Welcome! This is the menu display (yea, the Eden name is not up yet because the designer is still printing the signboard I think .. haha ) and as you can see, I baked cookies for sale, chocolate chip cookies to be exact. Yep, and now every week I have to rack my brains to think of what to sell at Eden. 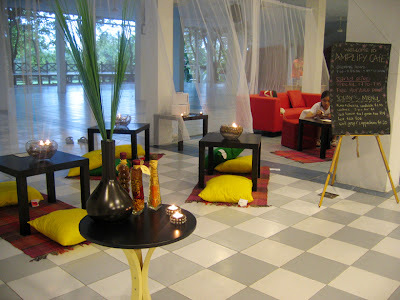 The area looks so dreamy and ‘lounge-like’ right? I love it! Most of the furniture we got at Ikea and the red sofa is actually from our room. Haha. Look at all the buzz. It’s amazing to see the area when it’s full of activity. It’s only the first week and the response has been really good. Gosh, I really have loads to say! I’m really anticipating what 2007 is going to bring. God is just so good and I feel really blessed in more ways than one. Having an opportunity to hone your baking and cooking skills – I mean come on, to me it’s a dream come true. Nothing gives me more joy than knowing that I’m able to serve and give to others what God has given to me. On a different note, ahhh… yes I’ve been busy busy busy, also because school started this week. Haha, yea I know what some of you are thinking – NUS starts school next week don’t they? Well yes, that’s true but this semester I’m actually studying at SMU. Yep, I applied for the local exchange programme. I know it sounds silly at first, but I mean seriously, I’m curious to know how things run at SMU. I love challenging myself and I really am going to make full use of this semester there and learn as much as I can. Besides it’s nearer to my home and it’s in town! I’m able to walk to Orchard Road or Bugis from SMU! P.S. For some of you who are wondering what I’ve been going on and on about – Amplify, etc. Well, just for those who don’t already know, I’m Catholic and I’ve been serving in Amplify, a youth ministry since 2002 and our mission statement is : To spread a love for Jesus Christ and His Church to every young person. Yep, well if you’re curious, you can find out more at our blog. You are a very talented baker and cook. I am sure many people will enjoy the goodies you sell. I wish you a blessed new year and a very fun one experimenting with new recipes. its cool to know you are serving passionately in church. 😉 Enjoy your school for the final sem! May there be more adventures of cooking, baking in this coming new year! Hey Cheryl, Yixiao here! I’m at SMU too.. It would be cool if we could meet up! SMU can be lots of fun, just dun have fun food to eat. enjoy your time in SMU, I know I will enjoy mine, coz last term liao, so gonna make full use of my time here. 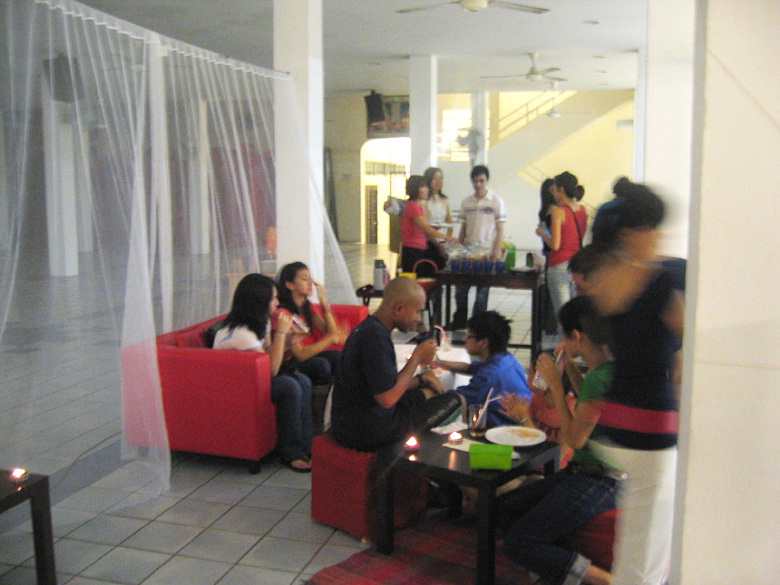 Do come down for our Patron’s Day, lots of party, perfomance, and food. simcooks: thanks for your kind words 🙂 i’m really excited about this. yippee! cupcaker: hey girl, thanks! i’m really glad to be doing something so fulfilling..
Vero: yea the cookie jars are cool aren’t they? so old school… those which you can put your entire hand into. I do suppose they might have it at other Ikeas 🙂 hope you find it! yixiao: hey hey! oh you from SMU? eh cool… pop me and email and we could arrange to meet up one day for lunch or something! wow, the lounge is really cool! God bless the business! May all your dreams and vision come true in year 2007! Your food really inspires me to start cooking again. Would be keen to buy some of your nutella cupcakes and cookies. What came as a bigger surprise was to encounter some old friends through your post on Amplify. Would sure hope to be able to connect with them.Has the group any affiliation to YPM? Sonicstarburst: hey stella, yea cook more! it’s fun :p and yes, just email me if you want to buy my bakes and we could work something out. Actually yes, Amplify is YPM. Wow what a coincidence for you to recognise them. You used to come for YPM? We used to be called YPM until we changed our name to Amplify around 2004 (it’s either 04 or 05). Hey, why not drop by whenever you’re free? We meet every Fridays at 7:30pm 🙂 email me if you need more details k? 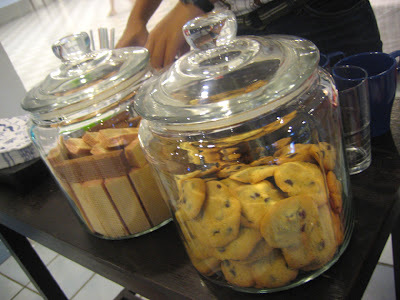 The lounge,the cookie jars and your cookies all look so good wish i could be there..
could i purchase some cookies from you if you’re doing more for your ministry please? can easily meet up near SMU… i’ve given up on the chocolate chips after 3x. grin!